Residents from a Concord apartment building on Saturday traveled to Hillsborough demanding that their landlord fix their homes allegedly riddled with mold and cockroaches. Folks claim the landlord has continued to raise rent prices by $300 on a monthly basis but failed to pay any attention to the laundry list of alleged transgressions, which also includes claims of water damage and mildew. 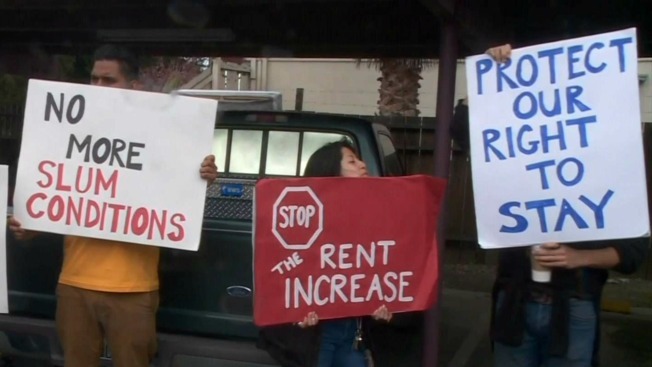 Members from the Alliance of Californians for Community Empowerment joined the residents and stood outside of the landlord's Peninsula home flashing signs that read "No More Slum Conditions" and "Stop the Rent Increase." Maria Valdarama, who has lived in the apartment complex for six years, says the lack of repairs to mold and water damage present health issues for her young children. Someone inside of the landlord's home spoke with the residents and advocates through the door, but no one came outside to directly meet with the group. NBC Bay Area has reached out to the landlord but has yet to receive a comment.